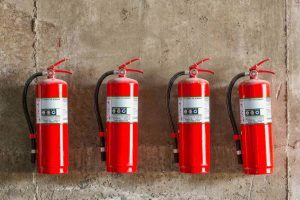 It doesn’t matter if you’re just a shop kiosk, or if you’re living in an apartment–a fire extinguisher can save your life in a dire situation, which could pop up at any time. Fire extinguishers are necessary for every home and business out there. It doesn’t matter if you’re just a shop kiosk, or if you’re living in an apartment–a fire extinguisher can save your life in a dire situation, which could pop up at any time. Even if you think there are no fire hazards around you, there could always be something you didn’t consider, like an electrical spark or a chemical reaction. When this happens, you need a fire extinguisher to combat it–but, how do they work? There are three types of extinguishers to choose from; water extinguishers, CO2 extinguishers, and dry chemical extinguishers. Each of these is used for a separate purpose, but water extinguishers are the most common. Just like a fire hydrant, they contain highly pressurized water that will shoot out at high speeds–this both douses the flame, and removes the oxygen that is fueling the fire. CO2 extinguishers use carbon dioxide to take away the heat and oxygen in the air that is causing the fire, and must be stored under high pressure. Finally, dry chemical extinguishers use a kind of foam powder propelled by pressurized nitrogen. It very simply smothers the fire, forcing it to extinguish. Water extinguishers are the bright red canisters with a simple valve and key system; the nozzle is relatively short, and is almost like a water gun. Pulling the ring or pin on the handle of the canister is essentially the same as turning off the safety lock on a pistol; then, the trigger is pressed, and highly pressurized water shoots out at the flame. CO2 fire extinguishers have long black horns rather than tiny nozzles. Inside, carbon dioxide swirls around and creates a kind of snow, or foam, that is sprayed to smother the fire. It’s important to know that a water extinguisher cannot be used on an electrical fire, as it can pose the risk of electrocution. You’ll need to find the class of extinguisher and its exact purpose to ensure you have the right one for the job. Need fire extinguishers? Judd Fire can provide them for you! Contact us today! You’re one step closer to reliable fire protection. Follow our blog for more updates, or you can follow us on Facebook, Twitter, and Pinterest. You can call us for 24/7 emergency service at 410-871-3480. This entry was posted on Thursday, January 26th, 2017 at 11:28 am. Both comments and pings are currently closed.